Ready for your gross out moment of the day? A recent study from the University of Manchester shows that more than 10 million bacteria are found on the average toothbrush. By comparison the average public bathroom floor has 2 million bacteria per square inch. Yep, your toothbrush could be more filthy than a public bathroom floor. I didn’t share that bit of information with you to cause you to spiral into a germaphobic pit of despair. 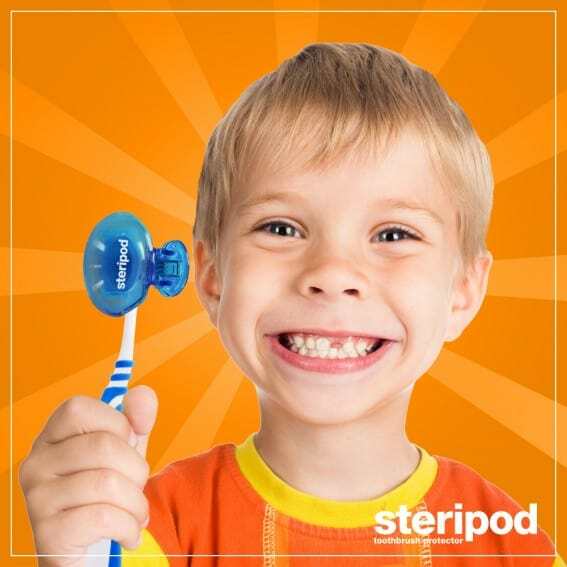 I shared it with you because I recently discovered a clean solution for your family’s toothbrushes- Steripod! 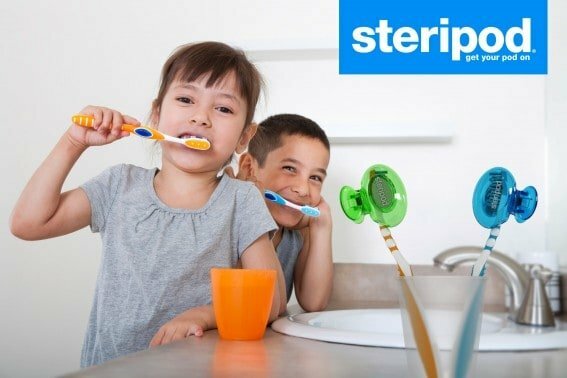 Steripod is a clip-on protector that fits any standard or electric toothbrush and keeps it fresh and clean for 3 months. The clip is super easy for children of all ages to use, perfect for home or travel, and manages to keep toothbrushes covered without leaving them moist and yucky like the average travel toothbrush cover. 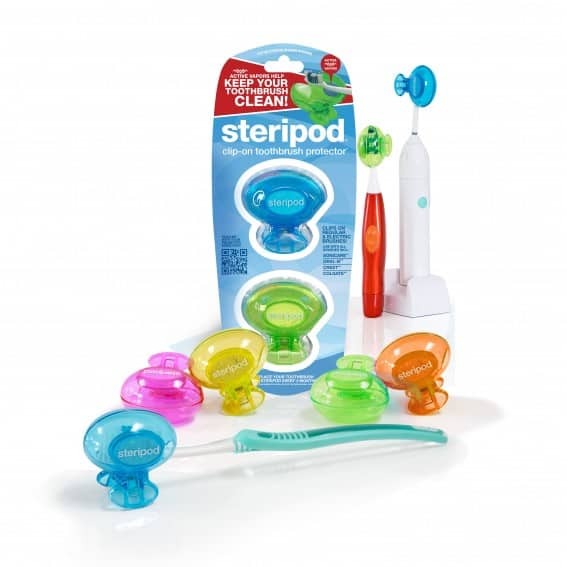 Each Steripod contains thymol- an ingredient found in many mouthwashes and oral antiseptics. They come in a variety of colors, making it easy for everyone in the family to identify their toothbrushes. My family recently used our Steripods while on a road trip through a few National Parks in Utah and Nevada and we all still put them on our toothbrushes every day at home. So long disgusting bacteria- we are officially converts! The company also makes a product called Razerpod which is a clip-on protector for your disposable razor, perfect for travel. Ready for a cleaner toothbrush and a little travel spending cash? Then we have got a giveaway for you! 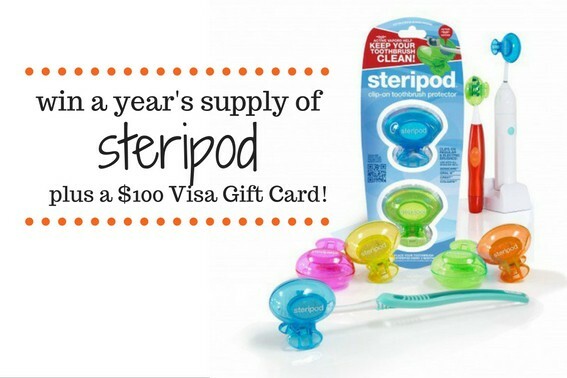 Enter to Win a Year’s Supply of Steripod for a Family of 4 and a $100 Visa Gift Card (3 Winners)! Grand prize winner (3 winners): 16 Steripods (a year’s supply for 4 people), 8 Razorpod razor protectors, and a $100 Visa gift card to put towards your next family getaway! After the winners have been confirmed, the winner will be announced on this blog post. Entry Period: August 22, 2016 at 12:01 AM PST to September 4, 2016 at 11:59 PM PST. Disclosure: The author received Steripods and Razorpods for the purposes of performing an unbiased review for Trekaroo. All opinions are her own.